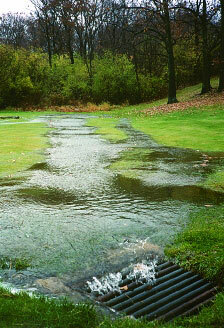 Stormwater, also spelled storm water, is water that originates during precipitation events and snow/ice melt. Stormwater can soak into the soil (infiltrate), be held on the surface and evaporate, or runoff and end up in nearby streams, rivers, or other water bodies. Nonpoint source (NPS) pollution is a term used to describe pollution resulting from many diffuse sources, in direct contrast to point source pollution which results from a single source. Nonpoint source pollution generally results from land runoff, precipitation, atmospheric deposition, drainage, seepage, or hydrological modification where tracing pollution back to a single source is difficult. In areas where there is no snow, runoff will come from rainfall. However, not all rainfall will produce runoff because storage from soils can absorb light showers. 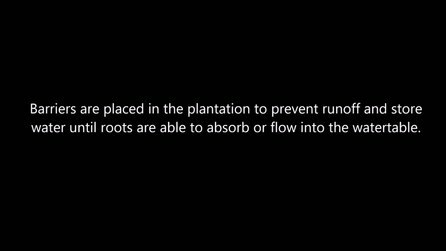 On the extremely ancient soils of Australia and Southern Africa,  proteoid roots with their extremely dense networks of root hairs can absorb so much rainwater as to prevent runoff even when substantial amounts of rain fall. In these regions, even on less infertile cracking clay soils, high amounts of rainfall and potential evaporation are needed to generate any surface runoff, leading to specialised adaptations to extremely variable (usually ephemeral) streams. In both the World Reference Base for Soil Resources (WRB) and the USDA soil taxonomy, a Vertisol is a soil in which there is a high content of expansive clay minerals, many of them known as montmorillonite, that form deep cracks in drier seasons or years. In a phenomenon known as argillipedoturbation, alternate shrinking and swelling causes self-ploughing, where the soil material consistently mixes itself, causing some Vertisols to have an extremely deep A horizon and no B horizon.. This heaving of the underlying material to the surface often creates a microrelief known as gilgai. 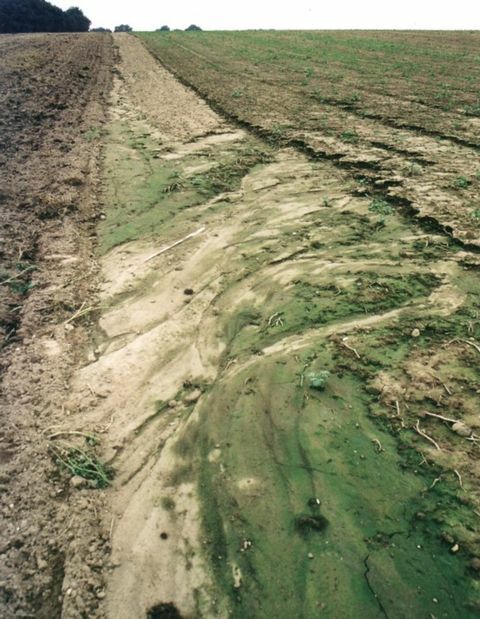 In hydrology and soil science, infiltration is the process by which water on the ground surface enters the soil. Infiltration rate is a measure of the temporal rate at which soil is able to absorb rainfall or irrigation. It is most often measured in millimetres per hour or inches per hour. The rate decreases as the soil becomes saturated. If the precipitation rate exceeds the infiltration rate, runoff will usually occur unless there is some physical barrier. It is related to the saturated hydraulic conductivity of the near-surface soil. The rate of infiltration can be measured using an infiltrometer. Robert Elmer Horton was an American civil engineer and soil scientist, considered by many to be the father of modern hydrology. A region is arid when it is characterized by a severe lack of available water, to the extent of hindering or preventing the growth and development of plant and animal life. Environments subject to arid climates tend to lack vegetation and are called xeric or desertic. Most "arid" climates straddle the Equator; these places include most of Africa and parts of South America, Central America, and Australia. Flooding occurs when a watercourse is unable to convey the quantity of runoff flowing downstream. The frequency with which this occurs is described by a return period. Flooding is a natural process, which maintains ecosystem composition and processes, but it can also be altered by land use changes such as river engineering. Floods can be both beneficial to societies or cause damage. Agriculture along the Nile floodplain took advantage of the seasonal flooding that deposited nutrients beneficial for crops. However, as the number and susceptibility of settlements increase, flooding increasingly becomes a natural hazard. In urban areas, surface runoff is the primary cause of urban flooding, known for its repetitive and costly impact on communities. Adverse impacts span loss of life, property damage, contamination of water supplies, loss of crops, and social dislocation and temporary homelessness. Floods are among the most devastating of natural disasters. In the 1950s or earlier hydrology transport models appeared to calculate quantities of runoff, primarily for flood forecasting. Beginning in the early 1970s computer models were developed to analyze the transport of runoff carrying water pollutants, which considered dissolution rates of various chemicals, infiltration into soils and ultimate pollutant load delivered to receiving waters. One of the earliest models addressing chemical dissolution in runoff and resulting transport was developed in the early 1970s under contract to the United States Environmental Protection Agency (EPA). This computer model formed the basis of much of the mitigation study that led to strategies for land use and chemical handling controls. The Nationwide Urban Runoff Program (NURP) is a research project conducted by the United States Environmental Protection Agency (EPA) between 1979 and 1983. It was the first comprehensive study of urban stormwater pollution across the United States. A retention basin, sometimes called a wet pond,wet detention basin or stormwater management pond, is an artificial lake with vegetation around the perimeter, and includes a permanent pool of water in its design. 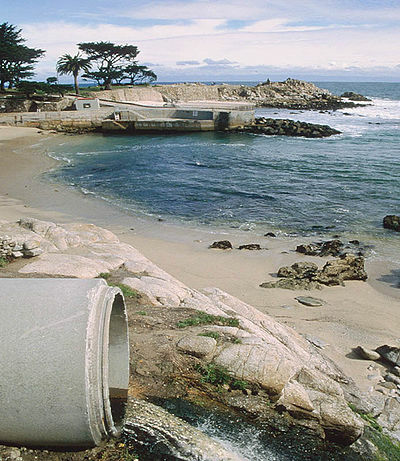 It is used to manage stormwater runoff to prevent flooding and downstream erosion, and improve water quality in an adjacent river, stream, lake or bay. Bioswales are landscape elements designed to concentrate or remove debris and pollution out of surface runoff water. 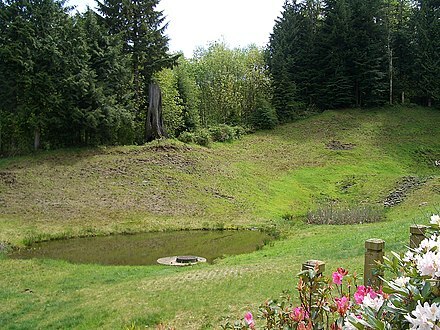 They consist of a swaled drainage course with gently sloped sides and filled with vegetation, compost and/or riprap. The water's flow path, along with the wide and shallow ditch, is designed to maximize the time water spends in the swale, which aids the collection and removal of pollutants, silt and debris. Bioswales are also beneficial in groundwater recharge and are effective stormwater mitigation tools. Depending upon the topography of the land, a bioswale may have a meandering or almost straight channel alignment. 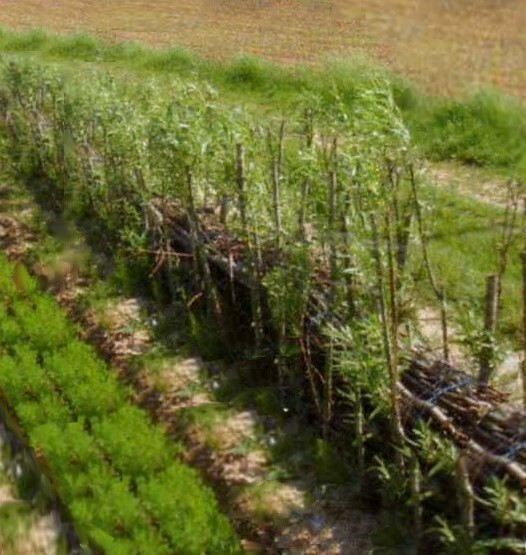 A bioswale's make-up can be influenced by many different variables, including climate, rainfall patterns, size of the site, budget, and available vegetation that can be planted. First flush is the initial surface runoff of a rainstorm. During this phase, water pollution entering storm drains in areas with high proportions of impervious surfaces is typically more concentrated compared to the remainder of the storm. Consequently, these high concentrations of urban runoff result in high levels of pollutants discharged from storm sewers to surface waters. The DSSAM Model is a computer simulation developed for the Truckee River to analyze water quality impacts from land use and wastewater management decisions in the Truckee River Basin. This area includes the cities of Reno and Sparks, Nevada as well as the Lake Tahoe Basin. The model is historically and alternatively called the Earth Metrics Truckee River Model. Since original development in 1984-1986 under contract to the U.S. Environmental Protection Agency (EPA), the model has been refined and successive versions have been dubbed DSSAM II and DSSAM III. This hydrology transport model is based upon a pollutant loading metric called Total maximum daily load (TMDL). The success of this flagship model contributed to the Agency’s broadened commitment to the use of the underlying TMDL protocol in its national policy for management of most river systems in the United States. 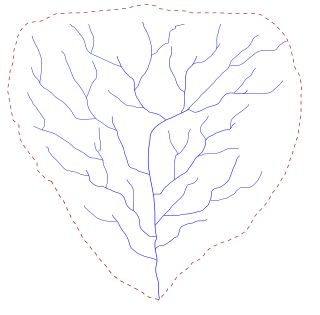 An hydrological transport model is a mathematical model used to simulate river or stream flow and calculate water quality parameters. These models generally came into use in the 1960s and 1970s when demand for numerical forecasting of water quality was driven by environmental legislation, and at a similar time widespread access to significant computer power became available. 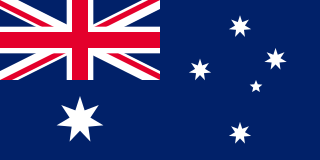 Much of the original model development took place in the United States and United Kingdom, but today these models are refined and used worldwide. Area sources are sources of pollution which emit a substance or radiation from a specified area. Best management practices (BMPs) is a term used in the United States and Canada to describe a type of water pollution control. Historically the term has referred to auxiliary pollution controls in the fields of industrial wastewater control and municipal sewage control, while in stormwater management and wetland management, BMPs may refer to a principal control or treatment technique as well. A fiber roll is a temporary erosion control and sediment control device used on construction sites to protect water quality in nearby streams, rivers, lakes and seas from sediment erosion. It is made of straw, coconut fiber or similar material formed into a tubular roll. Since the 1960s, water quality in surface water bodies in the United States has generally improved, due to the implementation of the 1972 Clean Water Act. However, many water bodies are still being polluted from one or more categories of sources, which may include agriculture, industry, or urban runoff. Nonpoint source (NPS) water pollution regulations are environmental regulations that restrict or limit water pollution from diffuse or nonpoint effluent sources such as polluted runoff from agricultural areas in a river catchments or wind-borne debris blowing out to sea. In the United States, governments have taken a number of legal and regulatory approaches to controlling NPS effluent. Nonpoint water pollution sources include, for example, leakage from underground storage tanks, storm water runoff, atmospheric deposition of contaminants, and golf course, agricultural, and forestry runoff. Nonpoint sources are the most significant single source of water pollution in the United States, accounting for almost half of all water pollution, and agricultural runoff is the single largest source of nonpoint source water pollution. This water pollution has a number of detrimental effects on human health and the environment. Unlike point source pollution, nonpoint source pollution arises from numerous and diverse sources, making identification, monitoring, and regulation more complex. Low-impact development (LID) is a term used in Canada and the United States to describe a land planning and engineering design approach to manage stormwater runoff as part of green infrastructure. LID emphasizes conservation and use of on-site natural features to protect water quality. This approach implements engineered small-scale hydrologic controls to replicate the pre-development hydrologic regime of watersheds through infiltrating, filtering, storing, evaporating, and detaining runoff close to its source. Green infrastructure investments are one approach that often yields multiple benefits and builds city resilience. 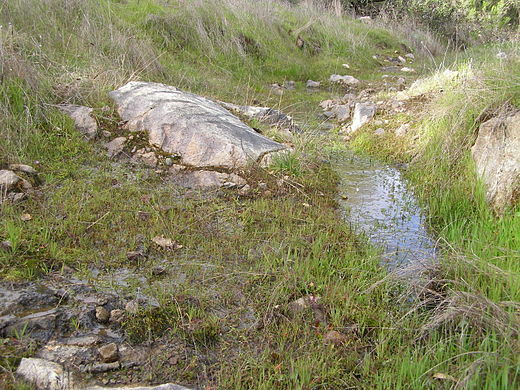 A runoff footprint is the total surface runoff that a site produces over the course of a year. According to the United States Environmental Protection Agency (EPA), stormwater is "rainwater and melted snow that runs off streets, lawns, and other sites." Urbanized areas with high concentrations of impervious surfaces like buildings, roads, and driveways produce large volumes of runoff which can lead to flooding, sewer overflows, and poor water quality. Since soil in urban areas can be compacted and have a low infiltration rate, the surface runoff estimated in a runoff footprint is not just from impervious surfaces, but also pervious areas including yards. The total runoff is a measure of the site’s contribution to stormwater issues in an area, especially in urban areas with sewer overflows. Completing a runoff footprint for a site allows a property owner to understand what areas on his or her site are producing the most runoff and what scenarios of stormwater green solutions like rain barrels and rain gardens are most effective in mitigating this runoff and its costs to the community. ↑ Wigley T.M.L & Jones P.D (1985). "Influences of precipitation changes and direct CO2 effects on streamflow". Letters to Nature. 314 (6007): 149–152. doi:10.1038/314149a0.